Hey there. Welcome to this weeks Read With Me. I read Amy Harmon's newest novel last week, Infinity + One, if you haven't read any books from this author yet then I highly recommend her, all of her books that I've read have been written so well!!! Thanks as always to all of those who linked up last week. Tracey over at One Frazzled Mum shared with us a short piece that she had written herself, simple yet really thought provoking!!! And the lovely Emma who writes My Book Corner tells us that we MUST read We Were Liars by E Lockhart. She doesn't give away to many details about the story but this has me more intrigued. I popped it straight on my TBR list. Now on to the link up. If you are new to #ReadWithMe you can read more about the linky right here. 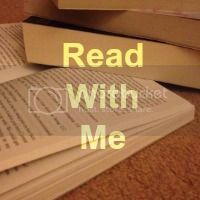 To all you regulars, lets get linking, any kind of book post, old or new, all are welcome! Please take the time to comment on atleast two other posts that link up and I of course would love you forever if you display my badge. Thanks for hosting, and for giving me a mention. Looking forward to hearing your opinion of We Were Liars!! Thank you Chantelle. I have tweeted about this. See if we can get 20 entries or more.